Charles Gaba: What next for HC.gov and the State Exchanges? Louise Norris: Obamacare’s subsidies upheld. What now? If you haven’t yet checked it out, don’t miss Joe Paduda’s three part posting on the profitability (or lack thereof) of workers comp. Part 1: If workers’ comp is so profitable, why is Liberty Mutual de-emphasizing the business? 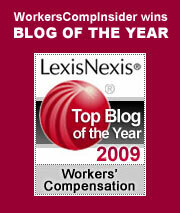 Part 2: Workers’ comp profitability, Part 3: Workers’ comp profitability. We’d like to welcome a new work comp related blog to our blogroll – Work Comp Psych Net – an eponymous blog from an organization of the same name. Work Comp Psych Net is a New Jersey-based network of behavioral health practitioners who facilitate return to work. They specialize in addressing psychological and mental health obstacles delaying return to work. such as PTSD, traumatic brain injury, chronic pain, adjustment and mood disorders, and the like. Massachusetts: Task Force Says Opioid Abuse an Epidemic – Claims J0urnal: “Massachusetts is in the midst of an epidemic of deadly opioid abuse, according to a task force created by Gov. Charlie Baker that said Monday that drug addiction must be considered a medical disease. The 18-member group released a total of 65 recommendations in the areas of prevention, education, intervention, and treatment and recovery, after holding a series of meetings around the state in recent months. New York Times: ‘The People v. the Coal Baron’ – At Coal Tattoo, Ken Ward Jr. dissects the recent NYT story on Don Blakenship, correcting the record on several counts. Ken Ward offers a sterling example of why local journalism is so vital. As the October 1 criminal trial of former Massey Energy CEO Don Blankenship approaches, we expect more national media coverage, but for the definitive source, you can’t do better than Ken Ward and his coverage at the Charleston Gazette. Will Robots Change Work Comp? When is Drug Screening Allowed?